Furianne: Stop & Chat: Thanksgiving Preparation! Last week we moved the hamster homes into the office. The temperature in the house has gotten cold enough that we were concerned for their comfort. We didn't want to pay to heat the entire house, however, when we could just throw on a few extra layers and call it a day. The solution we decided on was moving their homes to my office and keeping the door closed. That's made the office a pleasant temperature for the fluffybutts while letting us save money on heating. Woohoo! The only downside is that means all of the furniture in my office has been displaced except for the desk. As of right now, half of my office is still sitting in the kitchen waiting to be put away. I'll get around to it... eventually. I spent three days in a row hanging out with K. We had gone almost 3 months without really hanging out, and I guess we had to make up for it. :) It was loads of fun, and we laughed at ourselves for letting so much time pass before hanging out again. Throughout the week, the family and I have started playing Ark again. It all began when Dad realized how bored he was getting of WoW and I mentioned that I was still paying for our Ark server. Today, Mom and I went on a nice adventure to tame a mammoth and that's where the screenshot above came from. 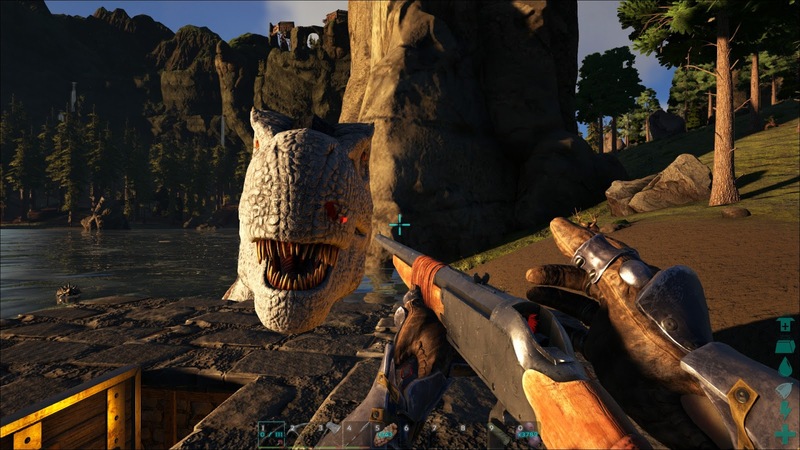 This rex decided to eat the mammoth I was going after before swimming off and getting eaten by sharks. Thanks. We still tamed a dire wolf and mammoth, just not the one I wanted. My supplies for my planner have finally made it here, and I've got to say I completely let myself get sucked into using stickers to decorate my planner. So much so that I've had to start thinking up a way to organize my planner sticker collection and I've started looking forward to that time of the week when I start putting on more stickers. It's like a perfect combination of tickling that creative DIY-ish part of my brain while helping me stay organized. My social media will probably enjoy the encroachment of pens, paper, planners, and stickers. Sunday night Michael and I joined C and her husband at another Great Escape room. This one's theme was Retro 90's Gaming. LOL! Talk about easy. We got out of there in half an hour with 0 hints. The employees were pretty impressed. This week has been fairly laid back so far. I spent a huge chunk of today cleaning the house and getting the old office furniture semi-organized. I still have a long way to go, but I'm happier overall with where the house is in terms of cleanliness. I have to deep clean and get the house prepared for a big Thanksgiving meal. Michael works on Thanksgiving, but he has a 3-day following it so we will open our house up to his friends. I of course take that to mean that our house has to be perfect and I have to make every bit of food under the sun. I also have a secret to tell you guys. I may actually enjoy the thought of entertaining guests. *gasp* I know. I'm shocked. Michael and I finally sat down and put together a menu and shopping list this weekend. I have ambitious plans, but I'm determined to make everything turn out perfect! It's weird having so many different groups I hang out with. I'm used to having one group/friend and that one person or group taking up 90% of my social interaction. Now I have several groups of people that are fairly separate from each other but I enjoy spending time with each and every one of them. I guess I'm really succeeding at my goals I set for myself in Korea! Moving forward has never been so fun, easy, hard, exhausting, and uplifting!